During 2018/19, the Royal Opera House in London’s Covent Garden will exclusively present ten thrilling performances of world-class opera and ballet to cinemas across Australia. This forms part of the Royal Opera House’s celebrations of ten years of cinema broadcasting in 2018 and of selling more than one million cinema tickets worldwide during the 2017/18 Season. Audiences in Australia, are never far from a performance at the Royal Opera House, with the performances screened in 19 Event Cinemas nationwide and from 7 Village Cinemas in Victoria and Hobart from November 2018 to July 2019. The 2018/19 programme opens with Kenneth MacMillan’s dark and dangerous ballet Mayerling on 11 November. Based on true events in the life of Austria’s Crown Prince Rudolf (danced by Australia’s Steven McRae), the ballet tells the story of a politically volatile empire, and an illicit love affair between Rudolf and the young Baroness Mary Vetsera (Sarah Lamb) which ends in tragedy. An impressive line-up of Australian talent will feature across these breath-taking performances, including Principals of the Royal Ballet Steven McRae and Alexander Campbell, soloists Benjamin Ella and Calvin Richardson and artist Harry Churches. “On the 10th anniversary of bringing world-class opera and ballet to audiences around the globe, we are thrilled to follow The Royal Ballet’s hugely successful visit to Queensland last year with a varied and spectacular season of cinema relays to Australia. Our partnership with Event and Village Cinemas reaches audiences all over the country, giving everyone the chance to enjoy the very best of opera and ballet from the Royal Opera House”. Starring Australian dancer Steven McRae in one of the most demanding roles ever created for a male dancer, Kenneth Macillan’s Mayerling features complex choreography exploring the final days of the psychologically tormented heir to the Habsburg Empire, Crown Prince Rudolf and his tragic illicit love affair with the young aristocrat Mary Vetsera. .
Set in India, Marius Petipa’s stunning ballet La Bayadère tells the story of a noble warrior betrothed to a princess but in love with a temple dancer. The famous moonlit ‘white act’ – the Kingdom of the Shades – is a corps de ballet highlight, starring Australian dancer Steven McRae. Bring the family together for a magical Christmas adventure with The Nutcracker. Tchaikovsky’s ravishing score perfectly conveys the magic of Clara’s adventure with her enchanted Nutcracker. Tchaikovsky’s final full-length opera The Queen of Spades is based on a short story by Alexander Pushkin and explores madness, obsessive passions and the supernatural, as the soldier Gherman finds himself torn between his love for Liza and a destructive fixation with gambling. This new production is set in 1890, with the characters giving voice to Tchaikovsky’s own unfulfilled desires. From the thrill of unexpected romance to a heartbreaking reconciliation that comes too late – Verdi’s La traviata is one of the most popular of all operas. Its stunning musical numbers include the famous Brindisi and the virtuoso aria ‘Sempre libera’, examples of the tunefulness and immediate lyrical appeal of Italian opera. 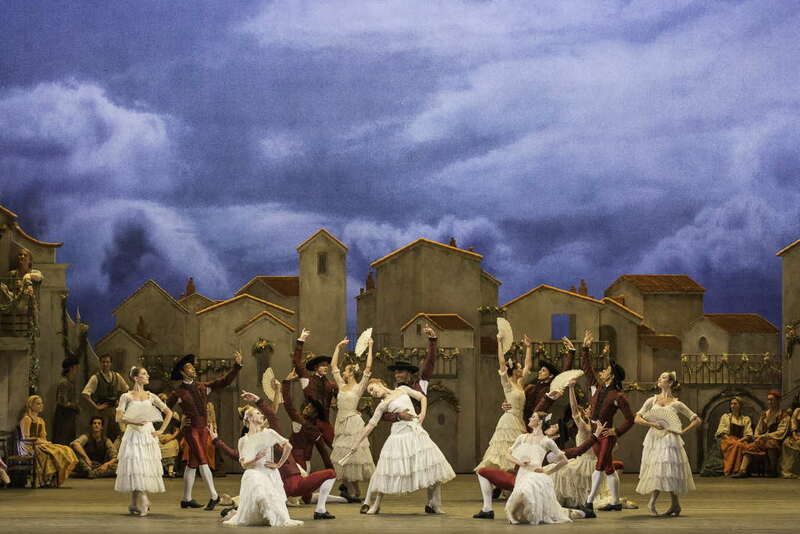 Carlos Acosta’s version of Marius Petipa’s sparkling ballet Don Quixote is full of Iberian sunshine. Inspired by Cervantes’s classic novel, the ballet tells the story of the idealistic and eccentric knight Don Quixote and his adventures with the young lovers Basilio and Kitri danced by Steven McRae and Akane Takada. Superstar singers Jonas Kaufmann and Anna Netrebko are the ill-fated lovers Don Alvaro and Leonora in Verdi’s epic opera La forza del destino. This operatic exploration of tragic passion, revenge and the enduring power of a father’s curse contains some of Verdi’s most wonderful arias and choruses and is staged in a powerfully cinematic production. Faust, is inspired by Goethe’s drama about a man who sells his soul to the Devil in exchange for youth and power. Gounod’s operatic version focuses on the tragic love affair between Faust and the young, innocent Marguerite, and contains stunning solo and choral numbers. Staged in a sensational production by David McVicar, with Michael Fabiano and Diana Damrau as Faust and Marguerite, this is the epitome of theatrical spectacle and musical pleasure. The contemporary skills of The Royal Ballet receive a memorable showcase with three sensational works: Christopher Wheeldon’s Within the Golden Hour, about seven couples separating and intermingling; Crystal Pite’s poignant reflection on migration Flight Pattern, revived for the first time; and the world premiere of a brand-new work by award-winning choreographer Sidi Larbi Cherkaoui. Since its 1965 premiere by The Royal Ballet, Kenneth MacMillan’s take on the world-renowned Shakespearean story of Romeo and Juliet has become a modern classic. The choreography captures the emotions of the star-crossed lovers, as the excitement of youthful love turns to tragedy in the heartbreaking final scene. All Wednesday sessions at Event Cinemas will include complimentary morning tea. Tickets costs $20 for adults, $18 for concessions, $102 for a multi pass to six titles.